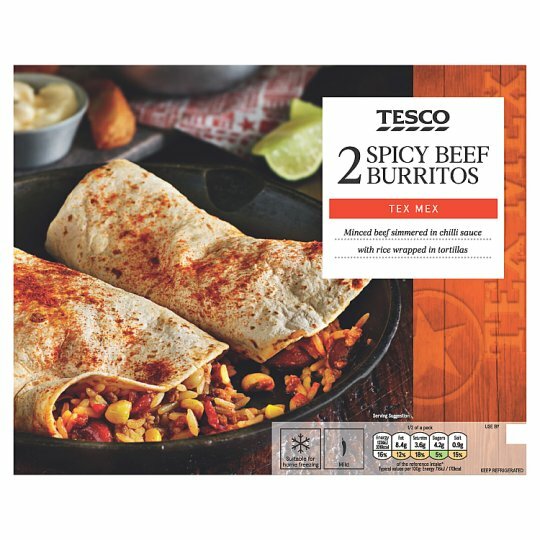 Minced beef chilli sauce, cooked seasoned rice and mozzarella cheese wrapped in a flour tortilla topped with smoked paprika. Cooked Seasoned Rice (35%), Wheat Flour (Wheat Flour, Calcium Carbonate, Iron, Niacin, Thiamin), Beef (12%), Water, Onion, Tomato, Red Pepper, Red Kidney Beans, Mozzarella Cheese (Milk), Tomato Purée, Rapeseed Oil, Palm Oil, Cornflour, Raising Agents (Sodium Bicarbonate, Disodium Diphosphate, Malic Acid), Garlic Purée, Muscovado Sugar, Lime Juice, Salt, Smoked Paprika, Sugar, Cumin, Stabiliser (Sodium Carboxymethylcellulose), Coriander, Caramelised Sugar Powder, Beef Extract, Onion Concentrate, Chilli Powder. Cooked Seasoned Rice contains: Water, Long Grain Rice, Sweetcorn, Black Eyed Beans, Lime Juice, Parsley, Dried Bell Pepper Flakes, Smoked Paprika, Salt, Black Pepper, Sugar, Smoked Onion Powder, Garlic Powder, Mustard Powder, Cumin, Turmeric. Instructions: From chilled: 190°C/Fan 170°C/Gas 5 25 mins. Remove film lid. Place on a baking tray in the centre of a pre-heated oven for 25 minutes. Leave to stand for 1 minute after heating. Instructions: From frozen: 190°C/Fan 170°C/Gas 5. Remove film lid. Place on a baking tray in the centre of a pre-heated oven for 30 minutes. Leave to stand for 1 minute after heating. Instructions: Not suitable for microwave heating.